Warm floors will have you purring like a kitten! 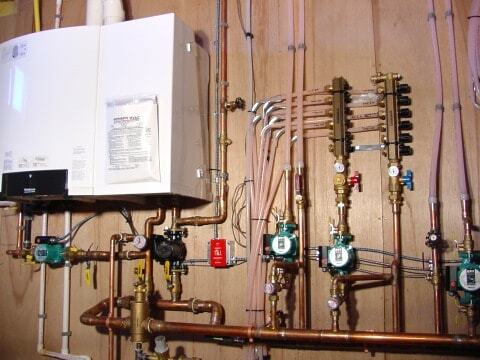 Radiant Heating Systems are more complicated to design than normal warm-air or hydronic systems. There are many of extra factors to take into consideration, including flow-rate, circulator sizing, water temperature, zoning, controls, wiring, lay-out, and more. This is why most Heating Contractors have to send out blueprints to a Design Company, which may never actually even see the site. The Heating Contractor then installs a system they may not understand, based on a set of instructions from the Design Company. What happens if the plans don't match the house? What happens if there are construction changes? What happens if the system doesn't work right? Is it an Installation problem or a Design problem? For the homeowner, it can quickly get very ugly, as the blame game begins. You deal with one company - one you know and trust! At Hannabery HVAC, we design, install, and service our own Radiant Systems. Our technicians attend the best Radiant Schools to stay on top of this ever-changing industry. We custom tailor each system specifically to the homeowner's needs and they are set-up to provide the ultimate in efficiency and comfort. We use only the best-name equipment, parts, and materials to help assure a long-lasting and worry-free system. Superior Comfort... Consistent, steady heat all winter long remaining near the floor where you are. Warm floors in kitchens and bathrooms... Beautiful wood and marble floors are even more enjoyable because they are now warm. Efficiency... Energy savings between 20 to 40% result. Zoning Ability... Radiant floor heating provides room by room temperature control, allowing more heat where you want it most. Decorating Freedom... because the system is encased in the floor, furnishings can be placed wherever you desire without concern for impairing heat distribution or hiding unsightly heating appliances. And radiant floor heating systems can be installed under any type of flooring, including wood, tile, concrete and carpet. Clean and draft-free... there are no noisy fans to blow dust and allergens around your home. Because the floors are warm, they dry quicker after mopping. Radiant Floor Heating Adds Value To The Home... Radiant floor heating can immediately increase the value of your home. Installing in slab or basement applications allows you to turn cold, damp areas into warm cozy living space - taking full advantage of all the available square footage in your home. Reliable... With millions of installations worldwide, they are extremely reliable. A boiler circulates warm water through tubing in or below your floors. As the floor heats up, it gives off radiant rays to all of the objects in the room; just as the sun heats our planet, which then warms the air and surrounding objects. Not only will the floors be warm, but everything in the room will be as well. A wall-mounted gas boiler and radiant heating system - huge space-saver! Can I Get Radiant Heat For My House? In most cases, yes. In existing homes with a second floor, it may be difficult to use radiant heat for the second floor but other options are available. Give us a call. We can set up a consultation with you at your home or office to go over all of the aspects of your radiant design. And remember, it's not just for home heating. We install radiant heating for driveway and sidewalk snow and ice melt systems as well. Why Should I Choose Radiant Heat? With Radiant Heat, your floors become large, mild radiators resulting in warm friendly floors. The system circulates warm water through flexible yet durable tubing that can be installed underneath virtually any type of flooring material... wood, tile, cement, even carpet. Installation is fast and easy. And the lower water temperatures needed for a radiant floor heating system means lower thermostat settings, which saves on monthly heating bills. In addition, zoning gives you room by room temperature control allowing you to place the heat where you want it. Radiant Heat Vs. Other Systems? Radiant Heat is better than forced-air heat because it keeps the air within the first five feet of the floor warmer than the rest. This allows for a cooler head but a warmer body. With forced-air heat, the warm air tends to rise causing the floors and your feet to feel cold. And Radiant Heat is better than baseboard heat as well. With no more baseboards or radiators along your walls and under windows, you are no longer restricted by furniture placement or decorating ideas. Rooms look larger and better, and the system is quieter. Gas-fired and Oil-fired hot water boilers are the perfect choice for In-Floor Radiant Heating Systems and Snow & Ice Melt Systems for driveways and sidewalks. As a licensed Air Conditioning & Heating Contractor, Hannabery HVAC provides high quality, professional Radiant Heating System and Snow & Ice Melt System installations, replacements, repairs, maintenance, and related services for the greater Lehigh Valley; including Allentown, Bethlehem, Easton, and all of Eastern Pennsylvania. 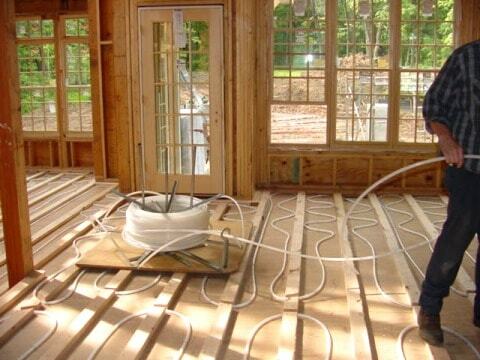 Have your Radiant Heating System professionally installed today!